WOW! promotes the communication between women writers, authors, editors, agents, publishers and readers. Stay up-to-date on writer's markets, events, author interviews, and more! We are dedicated to helping you achieve your writing dreams. Chances are, most of you spent some time yesterday celebrating motherhood. Flowers, sentimental greeting cards, big hugs, “I love you” phone calls . . . maybe even some Belgian waffles in bed. Of course, for women who yearn to be called “mama” but still have empty arms Mother’s Day can be a sad holiday. Today’s author, Sharon Simons, knows that feeling and wrote a book to celebrate all the world’s mothers, even those who don’t yet have their baby. Mom at Last: Why I Never Gave Up on Becoming a Mother traces the heartbreaking trail that Sharon followed as she tried to create a family. Mom at Last is the story of one woman’s journey to parenthood. Sharon’s journey is a long one that included many obstacles: vasectomies, IVF, miscarriages and the labyrinth that is adoption. It ends with a triumphant family found in Russia and now thriving in Delaware. This book is an inspirational tale for those struggling to create their families and a rousing reminder of the preciousness of family to those already busy raising children. Mom at Last is available as a print and e-book at Amazon and Barnes and Noble as well as independent book sellers. To win a copy of Mom at Last: How I Never Gave Up on Becoming a Mother, please enter using the Rafflecopter form at the bottom of this post. The giveaway contest closes this Friday, May 17 at 12:00 AM EST. We will announce the winner the same day in the Rafflecopter widget. Good luck! Born in New Jersey and living in Delaware, Sharon is married to her soul mate Rick and dreamed of becoming a mother. Sharon struggled to become a Mom, dealing with the uncertain world of infertility including three In Vitro Fertilizations, Tubal Pregnancy, and the Loss of a Pregnancy with twin boys at 19 weeks. That loss only made her more determined to become a Mom. Thankfully that dream became a reality due to International Adoption and she is the proud mom of two sons, Dylan and Hunter. Sharon is inspired to share her experiences, to offer insight, and inspire other women find their strength to achieve their goal of becoming mothers. Her passion involves using her journey to motherhood to educate and help women become a "Mom at Last." Her main message is to let women everywhere know that when you finally hold your child in your arms, no matter how that child became your child, you will understand and appreciate your journey to motherhood. WOW: You began by sharing your journey to motherhood through the Mom at Last community. Can you tell us a little about your Mom at Last community? 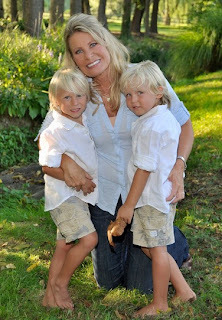 Sharon: I started www.momatlast.com after the adoption of my boys Dylan and Hunter. Never in my life did I think I would be a blogger or an author but after adopting the boys and feeling such overwhelming love and bonding I felt I needed to share our story. So I started the community and decided to write my memoir. The stories we share in the Mom At Last community are about mothers or women aspiring to be moms and their experiences. They can share and learn about in vitro fertilization, surrogacy, adoption, and other paths to motherhood. Members not only learn but receive emotional support. I personally went through three IVF's, a pregnancy loss of twins, and subsequently adopted. I feel I have been down the same path many women are headed and I am here to answer any questions I can. WOW: I can only imagine what you went through and the emotions . . . is that what made you decide to write a memoir? Sharon: I had no experience writing but had this intense feeling that my story needed to be told. I hope sharing my positive adoption story will help women understand that DNA is not important and motherhood is possible through a variety of paths. It always seemed to me that the negative adoption stories were featured in the media and I hope a positive story like my own will help people to know that success is possible and wonderful. We adopted our boys at 16 months and 23 months from Siberia, Russia and despite their initial circumstances they are thriving. They just needed love to flourish. WOW: Since you’re relatively new to it, what surprised you most about the writing process? Sharon: What surprised me most was how hard the writing process is, getting the words from your head to paper can be so difficult. I often say adopting my two boys was easier and less stressful than writing a book. I found time to write the book whenever I could, usually nights and weekends. I (eventually) discovered that "finding my voice" in telling our story was the most enjoyable and rewarding part of the writing process. I also have to thank my husband for assisting me as much as he did. I really feel it was a joint effort and I am so thankful for his help. WOW: What do you hope readers will take away from your book? Sharon: I hope they take away that anything, especially motherhood, is possible. Believe in yourself, don't give up, and it is never too late. I did not meet my husband until I was 39, and after many trials, tribulations, and heartaches I became a Mom. WOW: What was the most important thing motherhood has taught you? Sharon: How much loving these boys has changed my life. You get back so much more than you give. Motherhood is more than I ever could have imagined and I do not take it for granted. WOW: What advice do you have for people who may not think of themselves as writers but feel they have a story to tell? Sharon: Go for it. If you strongly believe in your story find a way to make it happen. Reach out for help if you need it, but be determined to see it through. WOW: And, because I love it so much, can you tell us the story behind your absolutely adorable book cover? Sharon: The cover photo actually helped inspire the book. The photo was taken at the end of our first summer with the boys, on the beach. We had it enlarged, framed and it sits over our fireplace. I would look at this photo and realize how fortunate we are. The picture reminds me of when we first brought them home and how far they've come. The boys were 16 months and 23 months old, sickly and emaciated, and in less than a year were healthy and thriving. They had also formed a bond as brothers. The photo shows what love can do, as it changed all of our lives. Inspired, I started Mom At Last and began writing our story, the process took 3 years. WOW: What a marvelous story! I would guess many of us have a favorite photo or two that really symbolizes what our family is all about. What are you working on now? Sharon: I recently finished developing and bringing to market my adoption "app," available on iTunes and other devices. The Adoption App helps you navigate the adoption process (domestic and international). I also just trademarked the name "Mommy's Sippy Cup" on glasses and cups. I am now selling a Vino to Go wine glass which is a wine glass inside a sippy cup. The logo "Mommy's Sippy Cup" is on it, the cup has a picture of a cluster of grapes with baby rattles as stems and pacifiers as grapes. I am working on expanding to coffee cups and martini glasses. I would also love to write a second book titled Moms At Last which would depict real life stories of women who struggled to become Moms. The book would talk about IVF, surrogacy, foster care, and of course adoption. WOW: I wonder how many of our WOW readers out there have a story they would like to share with you? Stop by for an interview with Sharon Simons and a chance to win her memoir Mom at Last! Learn more about author Sharon Simons from her surprise guest post and enter to win a copy of her memoir Mom at Last. Why do writers do the things they do? Find out today when Sharon Simons shares the story behind writing Mom at Last. Need the 411 on memoir Mom at Last by Sharon Simons? Don't miss today's review! Today's your chance to win a copy of a memoir about making a family against all the odds: Mom at Last. Learn more about the touching memoir Mom at Last. 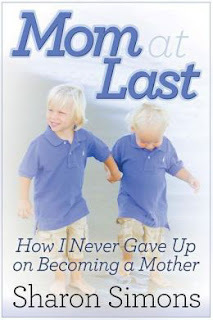 Stop by to learn why Sharon Simons took the leap to IVF and enter to win her memoir Mom at Last. Enter to win a copy of Mom at Last: Why I Never Gave Up on Becoming a Mother by Sharon Simons. Just fill out the Rafflecopter form below. We will announce the winner in the Rafflecopter widget this Friday, May 17. Jodi--Thanks for posting this interview. Sharon--As an adoptee who is in her 50's, I thank you for being brave enough to take the "tough" road to motherhood. The hoops you had to jump through, the waiting, the heartache, the uncertainty, the piles of paperwork...from what I heard from my mother, and from what I know about labor, your "labor pains" were much worse. I am sure you had a wonderful Mother's Day. So Glad YouDidn't Give Up! Thanks For The Giveaway! Blessings To You And Your Family! Love memoirs and this one sounds especially poignant. What a beautiful family! You are so brave--I love that you started a community Mom At Last--and I am going to pass the link on to my husband's cousin who has been through a lot of infertility treatments and is now waiting for the adoption dream to become real. I know it will work out for her as it has for you, but I know she needs some encouragement, and it seems you are the perfect person to do it! What a wonderful story (and a beautiful family)! Congratulations on your memoir.